(A) The 12-lead electrocardiogram at rest. 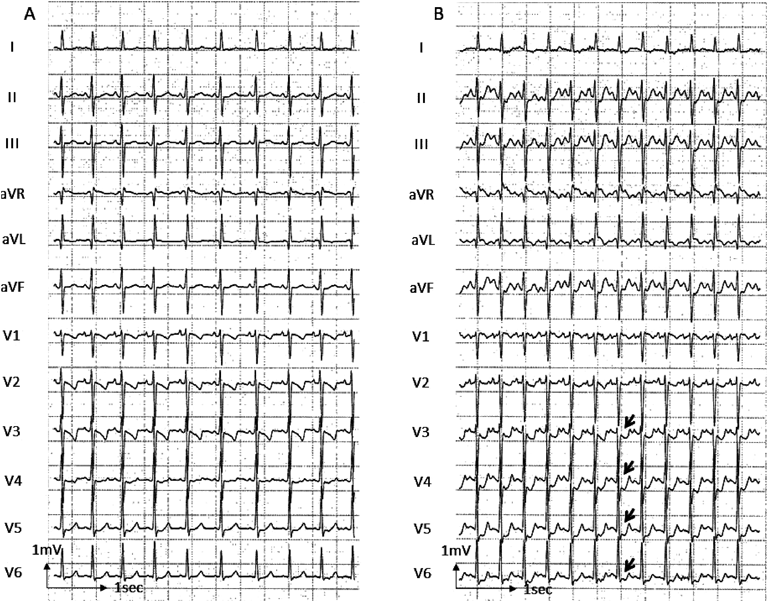 (B) The 12-lead electrocardiogram during exercise stress test at a workload of 8.4 METS. Exercise induced ST segment depression in leads V3–V6 (arrows). (A) Parasternal short axis view of the aortic root shows right coronary artery dilation with a diameter of 4.6 mm at #1. 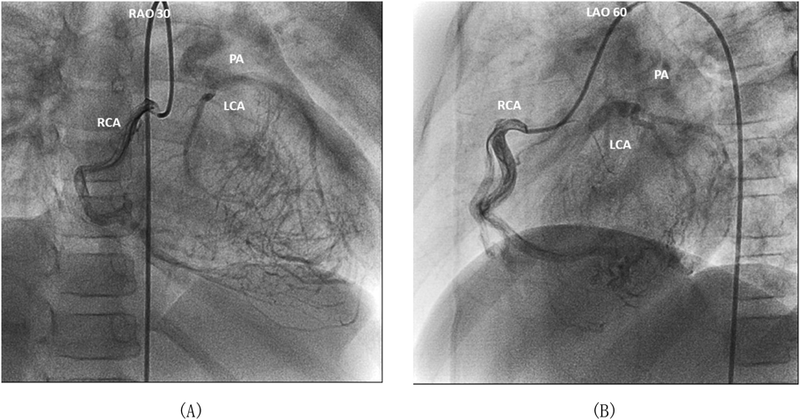 (B) In this view, the left coronary artery appears to be normally connected with the aorta. (C) Color Doppler echocardiography of tilted parasternal short axis view shows abnormal flow into the main pulmonary artery. 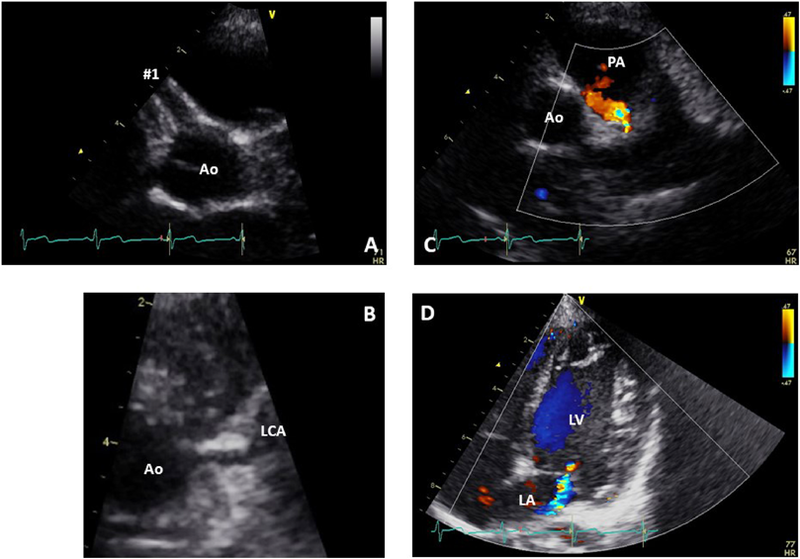 (D) Color Doppler echocardiography at the apical four-chamber view shows mild mitral regurgitation. Ao, aorta; LA, left atrium; LCA, left coronary artery; LV, left ventricle; PA, pulmonary artery. Selective right coronary angiography illustrates reverse blood flow from the right coronary artery into the left coronary artery through multiple collateral vessels and subsequent draining of the blood from the left coronary artery into the main pulmonary artery. LAO, left anterior oblique view; LCA, left coronary artery; PA, pulmonary artery; RAO, right anterior oblique view; RCA, right coronary artery.